Marketing Director at TechShop, Inc.
As Director of Marketing for TechShop, Inc., my responsibilities included the messaging of a company pivot, local marketing efforts across 10 US stores, and customer communications. As the sole agent of marketing at the corporate level, I held many responsibilities across the company. This included owning the entire design process for all corporate marketing materials. I directed photoshoots, hired content writers, wrote copy, dabbled in data visualization, and managed sales campaigns. Additionally, I designed company-wide publications, investor communications, class catalogues, social media posts, feasibility studies, and market assessments. I was also the de-facto UX lead and was responsible for the wireframing, user flows, and most content on new web pages. Prior to my role as Director of Marketing, I was the Senior Manager of Creative Media where I held many of the same responsibilities. 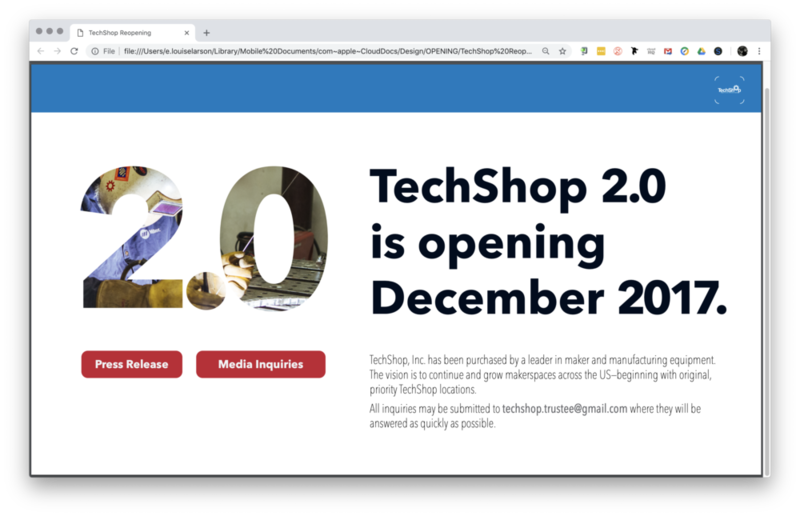 In 2016 TechShop had announced a pivot that would shift the focus of the core business to licensing and managed services. As part of new store development, I worked on a small executive team to assess and design market surveys for corporations, cities, and real estate developers. We accomplished the delivery of four surveys in major North American markets. As the only designer on the team I was responsible for the wireframes, layout, photography, data visualization, printing, and some content for these deliverables. The bulk of this work was designing and managing the +200-page market assessment documents. These documents included market plans, site surveys, design specifications, operational procedures, and detailed location assessments. These images are a sampling of the documents. In my role as Director of Marketing, I organization #MakerSeason, a company-wide campaign that resulted in 20 consultations within the first month. During this campaign, TechShop, Inc. provided free consultation to new maker or maker-adjacent organizations. These consultations created warm leads for future managed service clients. This campaign also highlighted the diversity of members across locations and expertise. I worked with a photographer and copywriter at our Bay Area store to develop member profiles to seed the effort. Each location added local flavor to the campaign by highlighting local talent through images and interviews. In partnership with the Director of Education, I created promotions for experimental classes geared toward millennials. These hands-on projects were delivered step-by-step in an immersive maker experience. One of the most popular classes was a guided journey through the process of woodworking and electronics in order to make a mid-century modern inspired bluetooth speaker. Makerspaces rely on classes for developing cohesive culture and consistent revenue. As class attendance and membership began to wane, I developed a profit-sharing workshop development program to create new offerings. These offerings expanded entry-level classes for new members and expert-level workshops for existing members. Many workshops required specialty equipment and materials. I was responsible for research and procurement of any supporting items. In expanding class offerings and equipment, I saw a growing interest in several new course types. Using member and instructor feedback, I created two of the most used studios: jewelry and blacksmithing. In tandem with the creation of more than 30 new classes, I also developed a new marketing strategy. The primary component of this strategy was the company's first course catalogue. This course catalogue included new classes, safety classes, youth programs, and company information. I worked with local photographers, writers, and designers to create the catalogue. Our work served as a template that inspired other TechShop locations to create their own catalogues. One of my major goals as Director of Marketing was to create a vibrant visual identity that featured the range of makers and talent across the membership. The logo and website were created and managed by the founding team, so my efforts were focused on new store development collateral, in-store marketing, member experience, and wireframes for the second iteration of the website. To assist stores in local marketing efforts, I created a media library of quality photography that showcases many different kinds of members. This media library also included apparel, brochures, and icon sets. All photography posted below was created at my direction with photographer Joseph Wyman.